Nicely written and romantic novella with a time travel dilemma. Karyn's books are an auto buy for me ! Such a sweet (yet spicy) short story and I am very happy to have bumped it up on my TBR list. 5.0 out of 5 stars...short & sweet; fun & entertaining; SENSUAL & HOT! Jude Deveraux`s "Knight in Shining Armor" is my all time favorite time travel book and Diane Gabaldon's "Outlander" series is a very close second, and while the movie "Kate and Leopold" is one movie I try never to miss when it's on, the original "The Time Machine" with Rod Taylor and Yvette Mimieux has to be one of my all time favorite time travel movies. I can freely state to all of you that if I was unattached and my hero showed up from another time, I wouldn't even think twice at not going back with him! Cave man from the stone ages?! I'll let him drag me by my hair, as long as he loves me (and looks like Hugh Jackman)! This book sounded very interesting, so I literally `stalked' the author on so many blogs just so I could win a copy! I'm surprised she didn't send the cops after me! Needles to say, I didn't win, but I did buy it for my PC for Kindle and let me start of by saying: I'm so glad I did; get to Amazon and do the same! Sandra Cranston is a chick on a self-imposed `sabbatical' from her job as an elementary school teacher. One day as she's returning from a picnic, her eye catches a site that gives her pause and spurns her on exploring it. Jerrod Ross is a propertied Squire and a copper mine owner in the year of Our Lord 1821. The last thing he remembers is a dangerous carriage ride with few other passengers through lightning and storm. And now he's looking at the woman with the most amazing eyes who's telling him that this is the Year of Our Lord 2011! This was so much fun to read. It's a short novella, but it certainly doesn't lack in romance, humor or sensuality. Our hero and heroine were equally hot, charming and witty that you can't help but chuckle at their banter as well as fan yourself when they give in to their desire for each other! It will also leave you torn and in tears at the end as both of them know that neither wants to let the other go, but is that what true love is all about? Can they let go? Or will one decide to go with the other to the unknown... Get the book to find out! This review was posted on my bookworm2bookworm website. This is my first Karyn Gerrard book and I enjoyed it tremendously. I've always like time travel ideas and having a hero land in modern times is a theme I enjoyed. It was a nice twist and the characters were well drawn, the conflict clear...a man of his time cared a lot about his good name. To learn his reputation had suffered in his own time was a blow...Gerrard explored the idea well. I recommend this book for readers who enjoy the spicy side of romance! Sandra is an elementary school teacher who is burnt out with her life and takes leave, eliminating any stresses of her life. Jerrod is a mine owner with many stresses and is ripped away from his life in Cornwall, England 1821. 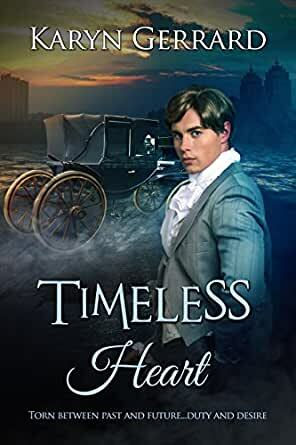 Sandra discovers an abandoned carriage in the woods with Jerrod inside and they both have an instant attraction to one another. I was at first hesitant in purchasing this, but I'm glad I did! It's got a mix of historical, time travel and a little touch of paranormal elements in this lovely story. Greatly recommend this! I gave the book a full four stars. I think the Author went very quickly and I had to go have and re-review previous chapters in order to get a clearer idea of the relation between past and present. At closure, I think a better explanation of how the story ended would have helped. Thank you for your attention.